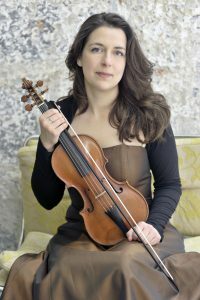 The violinist Božena Angelova was born in Maribor, Slovenia. After finishing the music school in Maribor, she studied violin, chamber music and baroque violin at the music academies in Klagenfurt , Bern, Basel, Palermo and at the university Mozarteum in Salzburg with Igor Ozim, Helfried Fister, Rainer Schmidt, Enrico Onofri and with Reinhard Goebel. She completed her master´s degree at the University Mozarteum with distinction. She won several prizes at national and international music competitions and was awarded with scholarships of the Slovenian and of the Swiss government. Božena performed as a soloist with the Carinthian symphony orchestra, with the Symphony orchestra of Maribor, with the Slovenian philharmonic orchestra in Ljubljana, as well as with the New chamber orchestra and the Ars academica orchestra in Spain and Germany. She recorded for the slovenian, austrian and for the mexican broadcasting company. She was a member of the Gustav Mahler Youth Orchestra. She plays regularly with the Camerata Salzburg, with the Stuttgart Chamber Orchestra and with the early music ensembles Il Suonar Parlante, Ensemble 1700 and with the Slovene ensemble Musica cubicularis. As a soloist and chamber musician she performs in Europe, in the USA and in Mexico. Since 2011 she has been a member of the string faculty at the University Mozarteum in Salzburg as a lecturer for violin and chamber music. She has given masterclasses for violin and chamber music in Europe and in Mexico.